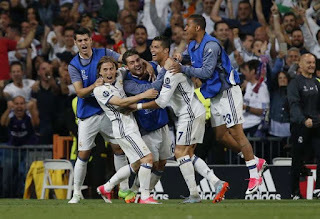 Real Madrid are through into the Champions League’s final four, having followed up last week’s 2-1 win away at Bayern Munich with a 4-2 victory in the return leg at the Santiago Bernabéu. However, it was a game mired in controversy, with the hosts having been the benefactors of a series of poor decisions from the match officials — including two missed offside calls as Cristiano Ronaldo netted yet another hat-trick. Madrid had reason to fear the Bayern threat in the first few minutes, with only a heroic Marcelo block preventing Thiago from burying a Franck Ribéry shot in the back of the net. The follow-up fell kindly for Arjen Robben, though the Dutchman’s effort rippled the side-netting. It set the tone for a series of early Bavarian raids, though they failed to bear fruit. It took until midway through the opening period, but steadily Madrid began to assume control. A Marcelo cross was glanced wide by Karim Benzema, shortly before Manuel Neuer was forced into a tremendous save on a low Dani Carvajal drive. The German keeper handed the hosts a chance after making a rare mistake just short of the half-hour, though Isco’s drilled shot was cleared off the line by Jérôme Boateng. Further chances fell to Toni Kroos and Ronaldo before halftime, though they all cleared the crossbar. Madrid remained on top, though the game was still goalless when the referee whistled for the break. Whatever Bayern coach Carlo Ancelotti said to his troops at halftime, it certainly paid dividends. Marcelo had already made a goalline clearance to deny Robben when Casemiro was adjudged to have illegally brought the Dutchman down in the box in the 52nd minute. Lewandowski stepped up to coolly convert, and blow the tie wide open. Bayern still trailed on away goals, but they were right back in the hunt. The momentum ensured Bayern remained in the ascendancy, though they were punished for their risk-taking with a quarter-hour left on the clock. It was a simple, direct goal, with Casemiro's teased ball clearing the Bayern defence before being headed home by Ronaldo. The Portuguese attacker had been enduring a difficult evening, though once again had delivered at the crunch. But unfortunately for Madrid, their joy was short lived. Barely a minute later Bayern had netted an all-important second, levelling the tie on both aggregate and away goals. It came in farcical circumstances, with a route-one ball causing chaos in the Madrid box. After some frantic scrambling, the ball bounced off Sergio Ramos and trickled agonisingly over the line. The next twist was in Madrid’s favour, with Bayern's Arturo Vidal dismissed for committing a second bookable offence with five minutes of normal time remaining. Replays showed the Chilean midfielder cleanly winning possession from Lucas Vázquez, with Madrid getting very lucky. Still, they weren’t able to make their numerical superiority count before the final whistle sounded, and extra time beckoned. The game remained very finely poised after the restart, with Madrid committing men forward but Bayern remaining a constant threat on the counter. 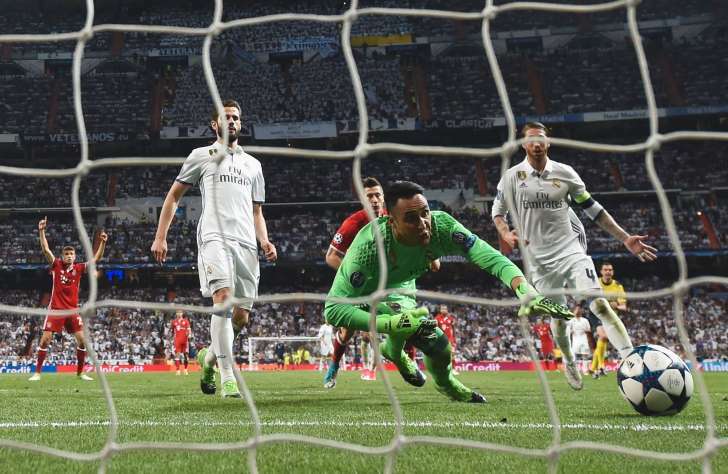 Neuer was drawn into an excellent save within nine minutes of the restart, when he sprung to his right to turn Marco Asensio's low shot around the post. Eventually the decisive goal came seconds before the interval, and once again Madrid were on the right side of a bad decision from the officials. Ronaldo was clearly offside when he brought down Ramos' deep hoof, though the flag stayed down and he slotted through Neuer’s legs. Bayern's fading hopes were dashed five minutes later, when that man popped up again to seal his hat-trick. Marcelo's burst straight through the centre of Bayern's fatigued midfield with embarrassing ease, eventually rolling the ball across the penalty area to leave Ronaldo with a tap-in. Madrid weren’t done there, with substitute Asensio adding a fourth within three minutes. It was the work of more individual brilliance, with Asensio bamboozling Mats Hummels with some mazy dribbling before burying the ball inside the far post. Only then did Bayern tighten things up, but there’s no doubt the final score was very flattering for their hosts. Real Madrid:Keylor Navas; Marcelo, Sergio Ramos, Nacho, Dani Carvajal; Toni Kroos (Mateo Kovačić 115'), Casemiro, Luka Modrić; Cristiano Ronaldo, Karim Benzema (Marco Asensio 64’), Isco (Lucas Vázquez 71’). Goals: Ronaldo (76’, 105’, 109’), Asensio (111’). Bayern Munich: Manuel Neuer; David Alaba, Jérôme Boateng, Mats Hummels, Philipp Lahm; Thiago Alcântara, Xabi Alonso (Thomas Müller 75’), Arturo Vidal; Franck Ribéry (Douglas Costa 71’), Robert Lewandowski (Joshua Kimmich 88’), Arjen Robben. Goals: Lewandowski (pen. 53’), Ramos o.g. (78’). Carlo Ancelotti isn’t the kind of coach to moan about referees, though the Italian would be well within his rights to lodge a complaint in the aftermath of this match. His side were on the receiving end of a number of poor refereeing decisions, from the harsh sending off of Arturo Vidal, to the failure of the linesman to flag Cristiano Ronaldo as offside on two of his three goals — including his decisive second. It was a particularly poor night for Hungarian referee Viktor Kassai and his team. Of course, Bayern were never going to be easy opponents for Madrid. But given the fact that they headed into this match with a healthy lead, having netted twice in their victory at the Allianz Arena, they really ought to have been able to hold on. As it was, they struggled defensively against their visitors — even when the Bavarians were a man short. It wasn’t a particularly intelligent performance from Zinedine Zidane’s side, who have done little to disprove the belief that they’re more reliant on individual brilliance than collective strategy. They'll have to be better in the semifinals. It wasn’t an especially good performance from Cristiano Ronaldo, who fluffed his lines on three occasions in the first half. He didn’t pose many problems for his opposite number Philipp Lahm, who looked relatively comfortable on the right side of Bayern’s defence. And yet, come the final whistle, the Portuguese international had netted five goals in the tie, and maintained his phenomenal Champions League scoring record. Madrid may frequently resemble an assortment of individuals more than a team, but when your individuals have such a knack for the big moment, maybe that just doesn’t matter.